In 1796, Amelia Simmons authored American Cookery—believed to be the first cookbook authored by an American published in the United States. Printed in Hartford by Hudson and Goodwin, Simmons’s work became so popular that public demand kept it in reprints for 35 years. Today, more important than the delicious meals the book helps readers prepare, American Cookery provides tremendous insight into the language and foods of the era that helped former colonists forge a uniquely American identity. We know little of Amelia Simmons other than she was an orphan and a woman of modest means. While most of her book detailed common and practical recipes, she also appealed to wider audiences with the inclusion of meals for those with larger budgets. What really made Simmons’s work unique, however, was its recognition of the deficiencies of existing British cookbooks when it came to understanding American culture. Unlike British cookbooks of the era, most of Simmons’s recipes centered on the use of corn meal—a staple of the American diet. 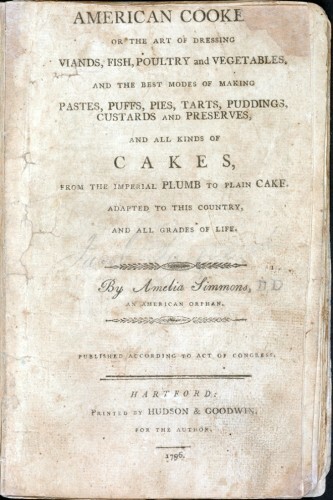 Simmons used corn in a number of her dishes, including her “Hoe Cake” and “Indian Slapjacks.” In addition to the insights provided by its choice of ingredients, American Cookery speaks to methods of early American food preparation. Most of Simmons’s recipes call for the production of food in large quantities, like a cake that required 2 pounds of butter and 15 eggs. Her syllabub (an alcoholic cider) called for sugar, nutmeg, and then milking a cow directly into the liquor. One of Simmons’s innovations that made its way back to Europe was her use of leavening agents believed to be the precursors to modern baking powders. This revolutionary practice avoided the need to beat air into the dough or add yeast. Additionally, Simmons’s recipe for spruce beer fermented with molasses helped treat scurvy on long sailing voyages. Simmons, Amelia. American Cookery, or, the Art of Dressing Viands, Fish, Poultry, and Vegetables: And the Best Modes of Making Pastes, Puffs, Pies, Tarts, Puddings, Custards, and Preserves: And All Kinds of Cakes, from the Imperial Plumb to Plain Cake, Adapted to This Country, and All Grades of Life. Hartford, CT: Hudson & Goodwin, 1796. Link.